What is Siver Rock 5? This is a range of heavy padlocks with zinc bodies to give the look and feel of a high security padlock. The blue silicone bumper ensures a layer of protection against the item it is securing and with a five pin cylinder, it allows a large number of key differs whilst making it also very difficult to pick. This is the standard open shackle Silver Rock 5 model suitable for 95% of applications. 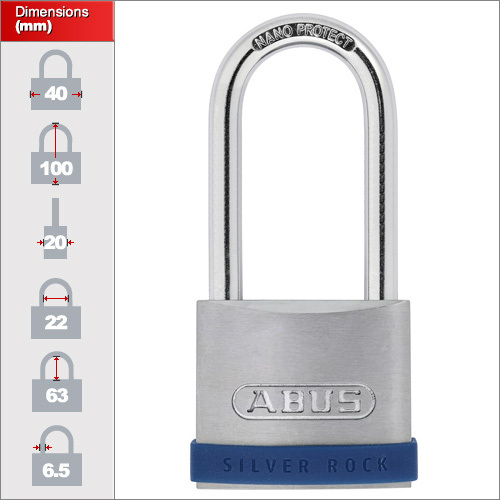 It has the same high quality stainless mechanism found in other ABUS padlocks with a strong hardened shackle that is finished with a special Nano coating meaning that they will not rust whilst remaining harder to cut than a stainless steel shackle. Also, being double bolted means that should someone be brave enough to try and cut through the shackle, they'll have to do it twice to remove the padlock. 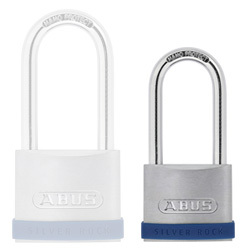 On our website we offer two sizes of standard Silver Rock 5 padlock. 40mm and 50mm. Please select your desired size from the drop down menu above. Each is of the same design and dimensions but have increased security with size. Your choice of padlock size depends on the application.